Thailand’s Koh Khai island goes by many names but formally Khai island. Koh in Thai translates to island and Khai (ไข่) means egg. Where it got the name of “egg island” is said to be from the color of the sand is the color of an egg shell or another theory is that turtles lay their eggs here. A third reason might also be because it is oval shaped like an egg. No matter how it got its name, this isn’t the only egg island Thailand. This article is for Koh Khai in Satun Province of Thailand, and not Koh Khai Nok. Koh Khai Nok is actually closer to Phuket which is further north in the Phang-Nga Province between Phuket and Krabi Thailand. Koh Khai is between Koh Tarutao and Koh Adang and is part of the Tarutao Marine National Park. Egg island is basically in the middle of nowhere and one of the few ways to get to Koh Khai is during your transport from Pakbara Thailand to Koh Lipe island. 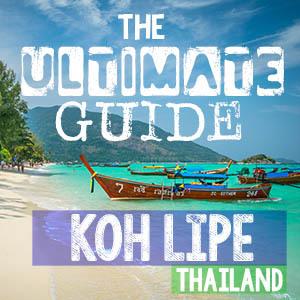 There are Koh Lipe ferries that will take you from mainland Thailand to Koh Lipe with a stop at Koh Khai and Koh Tarutao instead of going straight to Koh Lipe. If you’re island hopping in Thailand another way to arrange a visit to Koh Khai island is to hire a private tour off of the island from Koh Lipe. The longtail boats on Koh Lipe will not take you here, you will need to arrange transport via speedboat. It may be possible to find someone to take you, however, the only known official and easy way to visit Egg Island Thailand is to stop there on the way to Koh Lipe. There also may be a way to reach Koh Khai via a special speedboat day trip offered by some resorts like Tarutao Cabana Resort on Lipe, however, this is not a common day trip and only resorts with a speedboat will be able to offer this trip if any. The main draw to Koh Khai is the giant stone arch on the island. There are many photos online the claim this is the Koh Lipe stone arch, however, this is not on the island of Koh Lipe, but rather Koh Khai Island. Another deceiving thing about the photos of Koh Khai and the stone arch of the island is how big it actually is. Most photos make it seem quite small, but it’s actually an impressive stone arch. The stone arch of Koh Khai is the gem of the island, however, there is also a nice sandy beach and some interesting outcroppings of rocks on the western tip of the island. The biggest downside of visiting this island on the way while getting to Koh Lipe is that you’ll be there with many other people. It can be a bit crowded and the time you have on Koh Khai to take pictures of the stone arch is limited. Can You Stay On Koh Khai Island? No, overnight stays on Koh Khai are not permitted. There are no resorts or facilities on the island. Visitors may only stay on the island during the day and must stay on other surrounding islands. The best option to stay near Koh Khai is to stay in a Koh Lipe hotel which is 11 miles (18km) from the stone arch of Koh Khai Thailand. Alternatively, you can also stay on Koh Adang in one of the government operated bungalows or you are permitted to camp on Koh Adang, more Koh Adang info. LOTS of great inspiration here. Thanks for sharing! Thanks, hopefully we have added Koh Khai to your bucket list.